Few days back, we had a review of Kalki’s epic novel Ponniyin Selvan and had the question – where does a historical novelist get his characters from? Books on Indian history talk mostly about the North Indian dynasties and only a few lines are spent for the South Indian ones. Even in those few lines, only the famous kings are mentioned and details are just glossed over. Thus when it comes to the Cholas, you may hear about Raja Raja Choza I and Rajendra Choza, but not about Parantaka I or Parantaka II. One of the authoritative histories of South India, Nilakanta Sastri’s A History of South India provides more detail. According to Sastri, Parantaka I ascended the throne on 907 A.D and ruled for forty-eight years. Even though there was prosperity during his time, thirty years (955 – 85) after his reign there was a period of weakness and confusion. Parantaka I was succeeded by his son Gandaraditya who with his queen Sembiyan-mahadevi played a major role in religion than in politics. By the time of the death of Gandaraditya in 957, the Choza dynasty had shrunk to the size of a small principality. 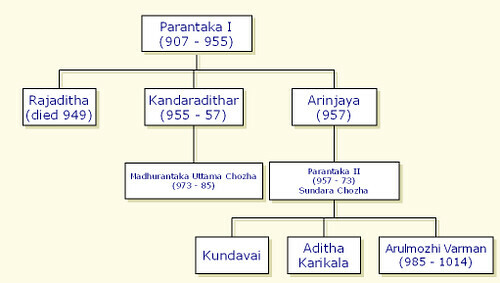 Gandaraditya’s brother Arinjaya ruled only for a year and was succeeded by his son Sundara Choza Parantaka II. His son Aditya II was made the yuvaraja and and Sundara Chozha turned his attention to the south to defeat Vira Pandya. Sundara Choza defeated him and Vira Pandya was killed by Aditya II. The last years of Sundara Chozha were clouded with tragedy and this is the story told by Kalki’s novel, Ponniyin Selvan. According to Nilakanta Sastri, Uttama Choza conspired to murder Aditya II and compelled Sundara Chozha to recognize him as the heir apparent. He ruled till 985 A.D and after that Arulmozhi Varman, Sundara Chozha’s second son took over and started the period of Choza imperialism. That’s all the information. So where does a novelist turn to find other characters and details of life at that time? What about Vandiyathevan or the conspirators Ravidasan and Soman, or Nandini? Did they really exist or were they created by Kalki? Kalki’s other sources were stone inscriptions, copper plates and other books. There is a stone tablet in the great temple of Thanjavur which has the following inscription: “The revered elder sister of Raja Raja Chozhar, the consort of Vallavarayar Vandiyathevar, Azwar Paranthakar Kundavaiyar”. The book sources were K.A.Nilakanta Sastri’s The Chozas and T.V.Sadasiva Pandarathar’s Pirkala Chozhar Charitttiram. The second book has a five line reference to Vandiyathevan and from that, he became the hero of this novel. The names of the conspirators also came from a stone inscription. Lot of information about the activities of various kings came from inscriptions like these as well as copper plates like the Anbil one. The Thiruvalangadu copper plates state, “The Choza people were very keen that after Sundara Chozan, Arulmozhi Varman should ascend the throne and rule their country. But Arulmozhi Varman respected the right of his Uncle Uttama Chozhan, the son of his father’s younger brother, Kandaradithan, to the throne and crowned him King”. In the conclusion of the novel, Kalki frames a set of questions which the reader may have about the characters after the end of the novel and he talks about each one of them, but does not give any sources for the information. When it comes to Emperor Asoka’s children, the standard line in most textbooks is about how Mahinda and Sanghamitta were sent to Ceylon to spread Buddhism. There is not much mention about his other children and what they did. He had other sons named Kunala and Tivara. Apparently he also had a daughter named Charumati, and recently one stupa constructed by her was found in the Kathmandu Valley. Archaeologists at the Department of Archaeology, a government institution to conserve and protect ancient monuments of the country, said this is the first time something has been found in the Kathmandu Valley written in Brahmi script, which was prevalent in 300 BC. Only two inscriptions have been found so far in Brahmi script in Nepal — one in Lumbini and the other in Lignihawa, both erected by emperor Ashoka. “We were just enlightened. We could not believe when we found bricks with a word in Brahmi script. This will surely open a new horizon in the history of the Kathmandu Valley,”said senior archaeologist Prakash Darnal. The brick has a Dharma-Chakra emblem, two Swastikas, a word “Cha-ru-wa-ti”in Brahmi script and also two other words in the most ancient form of Nepalbhasa script, Bhujimol. “Till date, historians believe that the sixth century AD inscription of Mandeva at the Changu Narayan is the oldest inscription found in the Valley and a statue of Jaya Barma, found at Mali Gaon, is regarded as made in the second century AD”, he said. “What we have found in Chabahil may prove that Kathmandu has a 2,300-year-old written history,”Darnal said. But he also added that the evidence is not yet scientifically tested and the word could have been written later in Brahmi script that was extinct by the second century in Nepal. Question: Who wrote ‘Om Jai Jagdish Hare’? 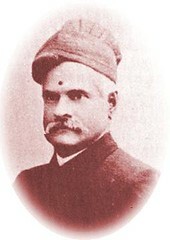 Raja Ravi Varma lived for a while in Maharashtra and painted many Maharashtrian women. He also ran a press in the town of Malavli. Two Italian curators Enrico Castelli and Giovanni Aprille visited the press few years back and found it in very bad condition. These lithographs (engraving on stone), can be seen in at the exhibition titled Divine Lithography, organised at the Indira Gandhi National Centre for Culture and Arts in Delhi. The exhibition is also traveling to Trivandrum and Pune. Alberuni, the father of Indian Historical writing? STRANGE that one of history’s cradles, the Indian peninsula, should have so little truck with genuine history, as opposed to myth-making and mythology. Is there any Indian Herodotus? Or Thucydides or Tacitus? One of the richest histories of the world, full of blood, conquest and great achievement without any chronicler, not even an apology of a Gibbon. Before Alberuni who accompanied the armies of Mahmud Ghaznavi, we have the Hindu holy texts, the Upanishads, Kautilya’s Arthashastra and Megasthene’s account of the court of Chandragupta Maurya. But nothing that can be credited as historical writing. Amir’s assertion is that till Muslims came to India, there was no historical writing. A civilization which was thriving from 2500 BC, did not have any “historical writing” till 1017 AD till Alberuni visited India, which is a big gap of 3500 years. Now what did Alberuni write about? Alberuni translated Patanjali’s Yoga-Sutra into Arabic (called Kitab Patanjal). He also wrote a monograph on Indic culture, Kitab al-Hind which did not achieve the prominence of other works of comparative religion written around the same time. Romila Thapar adds that Alberuni was the finest intellect of central Asia. In the ten years he spent in India, he made observations on Indian conditions, systems of knowledge, social norms and religion. His book Tahqiq-i-Hind is the most incisive made by any visitor to India. But was he the first person to indulge in some “historical writing” as Ayaz Amir writes. Around the same time Banabhatta wrote Harshacarita which provided a descriptions of significant events during the reign of Harshavardhana  This was the first biography in Sanskrit as well as a masterpiece of literature.. At this time Alberuni’s grandfather was not even born. Based on the reports of Damis, a native of Mesopotamia, who was linguist and diarist, we have a detailed report of the life of Gondophares, an Indo-Parthian king in Taxila. Damis’ diary informs us that the court of Gondophares was remarkably simple. The Greek philosopher, a follower of Zeno, the founder of the Stoic school, was pleased no end with the lack of display, a pleasant contrast to the pomp he had seen in Babylon and Persia. Damis tells us that the palace showed no “extraordinary magnificence, and was just like the house of any citizen of the better class”. There were no guards, a few servants and three or four persons waiting to speak with the king. The guest waited as the king finished his business with the persons already in audience. Then sat down with the travellers and following the preliminaries Apollonius asked him about his “mode of life”. The king explained that as a vegetarian and a keen gardener, he grew his own vegetables and fruit. Damis does not say so, but it seems as if the visitors were given a glimpse of the garden, which might have been right outside the audience hall. One wonders if the king also tried his hand at the now barely remembered sungtara orange that grows to this day in the last surviving sungtara orchards just a kilometre from the king’s palace. Gondophares, who ruled while Jesus Christ was alive, is also mentioned in early Christian texts, especially in connection with St. Thomas. Romila Thapar writes that, according to tradition, Thomas arrived at the court of Gondophares from eastern Mediterranean. John Keay notes that the word referred in the Acts of St Thomas was actually ‘Gudnaphar’ and it bears coincidental resemblance to Gondophares, the name found in the coins. John Keay also says that if this Thomas was really the Apostle or if he reached Punjab is really open to doubt.